A survey of Wall Street and independent analysts has found that all of them expect Apple to report record iPad sales when it releases its December quarter financial results on Jan. 24, though independent analysts have a 10 percent higher average than the Street's consensus of 13.5 million units. The 42 analysts polled by Fortune's Philip Elmer-DeWitt produced estimates ranging from 11.73 million to 19.47 million iPad units sold during the most recent quarter. The low estimate came from Gabelli & Co. analyst Hendi Susanto earlier in the December quarter, while the highest forecast came from Apple Finance Board's Alexis Cabot earlier this month. Both numbers were considered outliers by Elmer-DeWitt. By comparison, Apple set a record high for iPad sales in the September 2011 quarter with 11.2 million units. Assuming improved sales during the holiday season, Apple should have little trouble besting its previous record. According to the report, the survey revealed "more agreement than usual" among professional and independent analysts. The average estimate from independents was 14.8 million, roughly 10 percent more than the Wall Street average. The same poll of analysts conducted for Apple's iPhone last week saw a more than 12 percent difference between professionals and independents. When both groups are counted together, the consensus of nearly 14 million iPad units would imply 90 percent growth in iPad sales year over year. But, analysts have had some trouble accurately projecting iPad sales since the tablet was released in 2010. In the third quarter of calendar 2011, they were slightly disappointed by Apple's iPad results, as they were expecting sales of 11.92 million units. Some analysts have voiced concern that Amazon's new Kindle Fire tablet ate into some of Apple's iPad sales in the fourth quarter of calendar 2011. Investment research firm Morgan Keenan believes the Cupertino, Calif., company's results were adversely affected by one to two million units "at most." Canaccord Genuity's Michael Walkley projects total iPad sales of 55 million in the 2012 calendar year. Apple will report its fiscal first-quarter earnings on Tuesday, Jan. 24. The company is widely believed to have achieved a blowout quarter that will set all-time records for both the iPhone and the iPad. 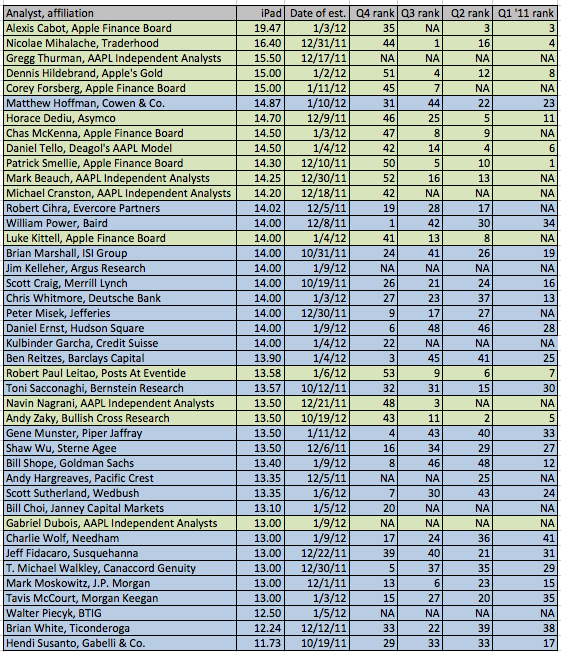 AppleInsider will provide live, extensive coverage of Apple's earnings report and subsequent conference call. iPad sales will likely see a significant jump in volume later this quarter, as recent reports have pointed to a launch of the third-generation iPad in March. Bloombergclaimed last Friday that the device is now in production and will include 4G LTE support, a high-resolution display and a quad-core processor.